In the previous part we have explained the prevalence of tobacco use in India and the age at initiation of tobacco use. In the second part we will explain the ways of tobacco use and its consequences. Tobacco is used in two ways or forms: Smoke and smokeless. In India, 28.6 per cent of adults currently use tobacco in any form. These 28.6 per cent tobacco users comprise 7.2 per cent of those who smoke but do not use smokeless tobacco, whereas 17.9 per cent use smokeless tobacco but do not smoke. The remaining 3.4 per cent smoke as well as use smokeless tobacco. One in every eight adult tobacco users in the country uses it in both ways. The below multi-map shows the percentage of adults aged 15 or above who currently smoke and use smokeless tobacco. The states with a higher percentage of adults who currently use tobacco for smoking are Mizoram, Meghalaya, Tripura, Arunachal Pradesh and Manipur. States with a higher percentage of male smokers are Mizoram, Meghalaya, Tripura, Arunachal Pradesh and Manipur. States with higher percentage of female smokers are Mizoram, Tripura, Meghalaya, Uttarakhand, and Manipur. Moreover, states with a lower percentage of adults who currently use tobacco for smoking are Maharashtra, Goa, Bihar, Chhattisgarh, and Odisha. States with lower percentages of male smokers are Maharashtra, Bihar, Goa, Chhattisgarh, and Punjab. Likewise, states with lower percentages of female smokers are Chhattisgarh, Odisha, Puducherry, Tamilnadu, and Kerala. The daily frequency of smoking or the number of cigarettes smoked every day is an important dimension of tobacco smoking; it reflects the level of addiction. The above chart explains the percentage distribution of daily smokers classified by the number of cigarettes smoked per day. A typical daily smoker in India smokes an average of 6.8 cigarettes every day. About half of all cigarette smokers smoke less than five cigarettes per day; 30 per cent smoke 5-9 cigarettes; 14 per cent smoke 10-14 cigarettes and about 3 per cent smoke more than 25 cigarettes per day. The above chart explains the age-wise percentage distribution of daily smokers classified by the number of cigarettes smoked per day. Prevalence of smoking is less among young adults aged 15-24. The mean of cigarettes smoked by young adults is 5.1. 3) the amount spent on last purchase. The below map shows the state-wise average monthly expenditure on cigarettes incurred by the daily smokers. The size of the circle shows the percentage of smokers in that state and the color shows the average monthly expenditure on cigarettes by the smokers. A daily cigarette smoker in India spends Rs 1,192.45 per month on average manufactured cigarettes. A daily smoker from states like Jammu and Kashmir and Punjab spends around Rs 2,600 per month on cigarettes, and daily smokers from Karnataka and Delhi spends more than Rs 1,500 per month on cigarettes. The states where the smokers spend less than Rs.500 monthly on cigarettes are Manipur, Madhya Pradesh and Chhattisgarh. The states where there is a higher percentage of adults who currently use smokeless tobacco are Tripura, Manipur, Odisha, Assam and Arunachal Pradesh. The states where there is a higher percentage of males using smokeless tobacco are Jharkhand, Odisha, Assam, Manipur and Arunachal Pradesh. Whereas, states where there is a higher percentage of females using smokeless tobacco are Tripura, Mizoram, Manipur, Odisha and Assam. The states where there is a lower percentage of adults who currently use smokeless tobacco are Himachal Pradesh, Jammu and Kashmir, Puducherry, Kerala and Chandigarh. And, states where there is a lower percentage of males using smokeless tobacco Puducherry, Himachal Pradesh, Jammu and Kashmir, Kerala and Andhra Pradesh. The states where there are a low percentage of females using smokeless tobacco are Himachal Pradesh, Punjab, Chandigarh, Jammu and Kashmir and Haryana. Prevalence of smokeless tobacco use is much higher than prevalence of tobacco smoking. This is the pattern we find in most states as well. However, in six states/UTs from the north, three states from the south, and three states from the north-east, the prevalence of smoking is higher than smokeless tobacco use. For example, in Jammu and Kashmir, 20.8 per cent adults smoke tobacco and 4.3 per cent use smokeless tobacco. Similarly, in Andhra Pradesh, 14.2 per cent smoke tobacco and 7.1 per cent use smokeless tobacco. As a general trend, dual use is low across states. Important exceptions to this are states from the north-east, where it could be more than one in 10 of the population. In Uttar Pradesh and Jharkhand, the prevalence of dual use is about 7 per cent. The above chart shows the percentage of adults aged 15 or above who are current users of various smokeless tobacco products in India. The two most commonly used smokeless tobacco products in India are khaini -- tobacco-lime mixture used by 11.2 per cent Indians and gutka -- mixture of tobacco, lime and areca nut used by 6.8 per cent adults. The above chart shows the age-wise percentage of adults aged 15 or above who are current users of smokeless tobacco. The prevalence of smokeless tobacco increases with age from 10.8 per cent among adolescents aged 15-24 to 29.6 per cent among adults aged 65 or above. Tobacco use has predominantly negative effects on human health. Concerns about health effects of tobacco have a long history. According World Health Organisation (WHO) tobacco contains more than 50 chemicals that cause cancer. Tobacco also contains nicotine which is a highly psychoactive drug. Tobacco use is the single greatest cause of preventable death globally. According to National Institute of Cancer Prevention and Research, oral cancer is the most common cancer in India amongst men and fifth most frequently occurring cancer amongst women. It is the third most frequently occurring cancer in India amongst both men and women. 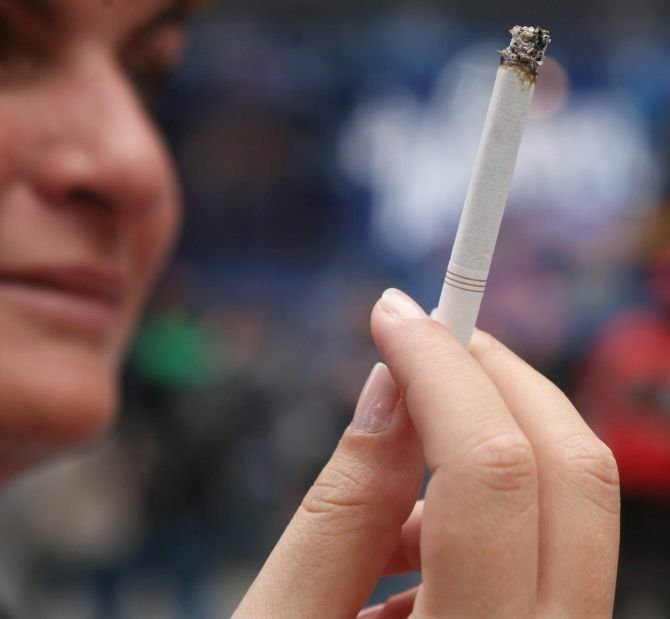 Around 80 per cent of oral cancer cases are directly attributable to tobacco use. Smokeless tobacco is more prevalent than cigarettes or bidis in India. Cancers of oral cavity and lungs in males and cervix and breast in females account for over 50 per cent of all cancer deaths in India. The rates for oral cancer among males are significantly higher than females and these rates increase with age. The survival rate of patients with early stage oral cancer is 82 per cent and patients with advanced stage oral cancer is 27 per cent. This cancer can be prevented by saying no to tobacco. Tobacco use is always injurious to health.